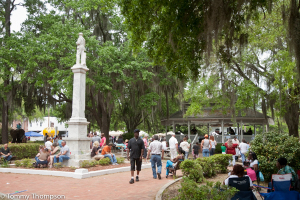 Madison Florida’s Down Home Days offers fun for the entire family! Leaps, dunks and hilarious basketball tricks are in the making for the 2015 Down Home Days for a two-night Celebrity Basketball Game and Mad Ball Tournament with three former Harlem Globetrotters, Melvin Adams, Michael St. Julien and Alex Sanders, suiting up nightly on April 17 and 18 at 7 p.m. at Madison County Central School gymnasium at 2093 U.S. 90 West in Madison. “I think it’ll be very popular,” said Lisa Frieman, executive director of the Madison County Chamber of Commerce & Tourism. The audience will thrill as one local boys’ team and a girls’ team compete against the former Globetrotters in the Friday night Mad Ball Playoff Tournament. Saturday night is the former Trotters’ Celebrity Basketball exhibition game: share in their comedic trick shots, slick passing behind-the-back, and through the legs with thunderous dunks for a fun night. “Your choices today will determine where you’ll be tomorrow,” said Melvin Adams, former NBA player and three-year former Harlem Globetrotter at 5’8,” who has played basketball around the world. Adams’ father passed away when he was only 13, but he overcame poverty by concentrating on his basketball skills. He now gives encouraging talks to students in schools and at his basketball camps. According to the Guinness Book of World Records, Melvin Adams is still the fastest dribbler in the world. Also preparing to play Celebrity Basketball for Down Home Days in Madison: Alex Sanders, a three-year former Harlem Globetrotter from Louisville University, a past McDonald All American standing at 6’9,” as well as former Globetrotter player and coach, Mike “The Saint” St. Julien from Lafayette, LA hailing from McNeese University. St. Julien is 6’5”. The Mad Ball Tournament tickets for April 17 featuring the former Harlem Globetrotters may be purchased for $10 per person, age five and up. Four and under is no charge. Celebrity Basketball Game tickets on April 18 are the same price, available at the door. The 34th annual Down Home Days weekend features the announcement of the Citizen of the Year, the Becky’s Dance Steps Studio Street Recital downtown on Friday evening, April 17, followed on April 18 by the historic Down Home Days Festival 9 a.m.-3 p.m. and Parade beginning at 10 a.m. in downtown Madison. This year’s Down Home Days Parade has a special theme: “Slam-Dunk for Exercise!” Parade floats will reflect the excitement of sports and healthy exercise activities in Madison County. 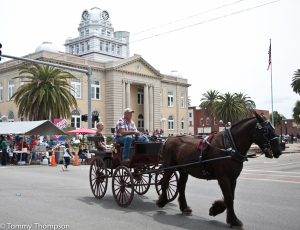 The parade will begin at O’Neal’s Restaurant and go straight past the courthouse to keep traffic moving. The Down Home Days classic car show in Four Freedoms Park always brings plenty of “oohs” and “ahhs,” plus the antique tractor and engine show at the Cotton Gin, Petting Zoo, Frog Hop, Pet Contest, Bake Off, Watermelon Seed Spitting contest, 1k and 5k walk/runs, and delicious festival foods lining S.W Range Avenue give festival attendees lots of choices. Down Home Days sponsor, vendor, and parade applications will be available online soon at www.madisonfl.org under the Down Home Days tab, as well as on the Down Home Days Facebook, or apply at the Madison County Chamber of Commerce and Tourism, 316 SW Pinckney Street in downtown Madison, across from Rancho Grande Mexican Restaurant.